The reduction could include the closing of up to five domestic plants. In the most far-reaching shake-up since the company emerged from bankruptcy more than eight years ago, General Motors will shutter three North American assembly plants and two other facilities, while also eliminating 15 percent of its salaried and salaried contract workforce, moves that together will cost an estimated 14,700 jobs. The cuts are part of a plan to adapt to changing market demands favoring SUVs over sedans and coupes, while also shifting focus to the electrified and self-driving vehicles GM sees as central to the industry’s future. “We recognize the need to stay in front of changing market conditions and customer preferences to position our company for long-term success,” said GM Chairman and Chief Executive Officer Mary Barra, who outlined her new plan during a conference call Monday morning. Barra was reportedly preparing to meet with White House economic adviser Larry Kudlow, following the company's announcement, according to CNBC. Earlier this year, GM warned that President Donald Trump's import tariffs "could lead to a smaller GM, a reduced presence at home and abroad for this iconic American company, and risk fewer — not more — U.S. jobs,” according to a statement the auto giant released in July to the Commerce Department. About 5,600 jobs will be lost at the three assembly plants set to close by the end of 2019. 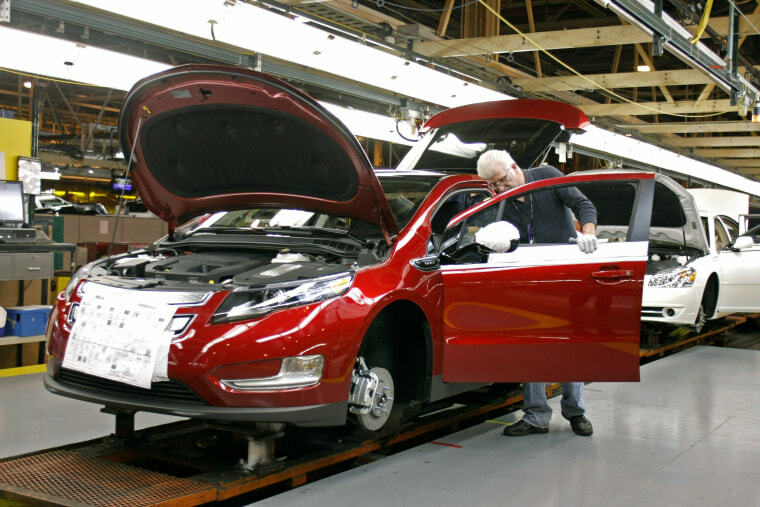 That includes 1,500 at the Detroit-Hamtramck facility that currently produces the Chevrolet Volt plug-in hybrid, as well as the Chevrolet Impala, Cadillac CT6 and Buick LaCrosse sedan. Trump told reporters Monday afternoon he was "not happy" about the news, adding that that the U.S. "has done a lot" for GM, and that the auto giant "had better put something else" in Ohio, one of the states where layoffs have been announced. Another 1,600 jobs will be cut in Lordstown, Ohio, a plant producing the slow-selling Chevrolet Cruze. The factory already saw two of its three shifts cut since early 2017 due to declining demand, with earlier cuts impacting 3,000 employees. The Oshawa, Ontario, factory will see 2,500 jobs eliminated. The factory currently produces models such as the Chevrolet Silverado and GMC Sierra pickup, as well as the Chevrolet Impala and Cadillac XTS sedan. Also on the chopping block are powertrain plants in Warren, Michigan, and Baltimore, Maryland. The plant closures are scheduled to take place in what will already be a tense environment. The United Auto Workers Union, which represents all but the Oshawa factory, will return to the bargaining table in 2019, with a goal of hammering out a new, four-year contract sometime around mid-September. The cuts are certain to be a key issue during those talks, though it is uncertain whether GM will be willing to keep one or more of the facilities open in return for concessions, as it has done in years past. Among the many uncertainties is what GM will do with the various products affected by the closings. The Chevy Cruze and Impala models, as well as the Cadillac XTS, were expected by many analysts to be dropped due to slow sales. But the all-new Silverado and Sierra pickups are flying off dealer lots and will be expected to move into one or more of the GM plants that will remain open. The cuts aren’t limited to the factory floor. GM previously announced it would be using buyouts to eliminate up to 7,000 white-collar jobs. Monday's news confirmed "involuntary separations" that will ultimately eliminate about 15 percent of its salaried jobs. Monday’s announcement didn’t come entirely as a surprise. Reports of plant closings had begun to circulate in recent days, though not to nearly the extent the automaker revealed. During its bid to survive bankruptcy in 2009, GM closed a number of plants and eliminated four of its North American brands. But once it emerged from Chapter 11 protection it began investing billions in a modernization plan. But it also signaled a willingness to shift directions, especially when Barra came on as its new CEO in January 2014. The GM veteran, who began on the factory floor, moved to pull out of unprofitable markets like Russia and South Africa, a strategy capped by the sale of its long-struggling European subsidiary Opel-Vauxhall last year. Barra has authorized a rapid push into technologies expected to dominate the transportation industry in the coming decades. GM purchased Cruise Automation, a California-based autonomous vehicle development company, for $1 billion. It hopes to begin putting fully driverless vehicles into a pilot ride-sharing fleet next year. The Detroit automaker also has announced plans to rapidly expand its line-up of battery cars shifting away from the gas and diesel models that today dominate its line-up. Not only is GM paring back on what it now views as old-style product lines and unprofitable operations, it is also moving to form alliances that can help it both fund and speed up its focus on future technologies. In January 2017 it announced a partnership with Honda to develop and build fuel-cell systems. The two launched a second venture this fall that will see Honda ultimately invest about $2.75 billion to develop self-driving vehicles. That will include a $750 million stake in Cruise Automation. GM isn’t the only automaker trying to reposition itself for the future. Ford has also announced plans to eliminate thousands of jobs. And though it has not given details about plant closures, the second-largest of the domestic automakers did scrub plans for a second assembly line in Mexico last year due to declining passenger car sales. “I am deeply frustrated with General Motors’ decision to shut down its Lordstown plant and disappointed with how the hardworking employees there have been treated throughout this process," Sen. Rob Portman, R-Ohio, said in a statement. The UAW also was quick to respond, and vowed to fight the GM restructuring. “This callous decision by GM to reduce or cease operations in American plants, while opening or increasing production in Mexico and China plants for sales to American consumers, is, in its implementation, profoundly damaging to our American workforce,” said Terry Dittes, UAW Vice President, Director GM Department. “GM’s production decisions, in light of employee concessions during the economic downturn and a taxpayer bailout from bankruptcy, puts profits before the working families of this country whose personal sacrifices stood with GM during those dark days. These decisions are a slap in the face to the memory and recall of that historical American-made bailout,” he said. Paul A. Eisenstein is an NBC News contributor who covers the auto industry.